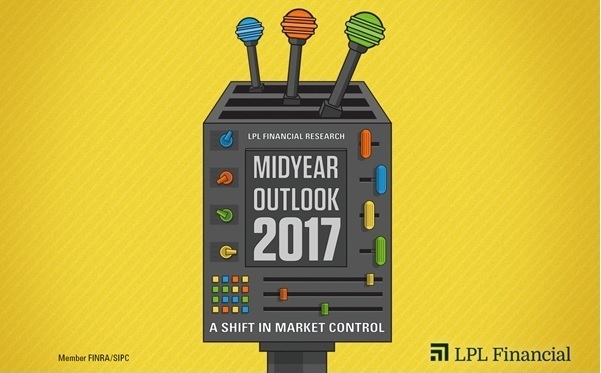 Midyear Outlook 2017 | Collier Wealth Management, Inc.
A long-overdue and highly anticipated shift is underway that may change the character of the rest of this economic cycle. Specifically, the Federal Reserve (Fed) has finally been able to follow through on its projected rate hike path, including the second hike for 2017 announced at the conclusion of the Federal Open Market Committee’s June 13–14 meeting. This move highlights two important signals—first, the Fed increasingly trusts that the economy has largely met its dual mandate of 2% inflation and full employment, but second and of perhaps even greater importance, it appears there may finally be a new driver—the long-awaited arrival of fiscal policy—that may provide the economic backstop that monetary policy has offered throughout this recent expansion. Monetary policy: Slow path to normalization. Maintaining economic growth without extraordinary central bank support will be key. Business fundamentals: Now taking control. A focus on well-run businesses with the potential for earnings gains may favor active management. Economic growth: Confidence not enough, yet. Business and consumer confidence has improved, but greater policy clarity may be needed to spur growth. Fiscal policy: Pro-growth potential, but when? Fiscal policy support remains likely, but the timetable may be pushed back to 2018. Even with fiscal policy on standby, the return to business fundamentals, such as renewed corporate earnings growth, can now act as a market catalyst. The Fed will still have its role to play, but monetary policy is powering down as the driver of financial market strength. Thus far in 2017, the consistency of this new fiscal-led dynamic has been uneven, leading to shifting market leadership. It is important for investors to appreciate that despite these developments, U.S. equity indexes managed to progress through the first half of 2017 either at, or very near, all-time highs. As political distractions have periodically surfaced, anticipation of a full transfer away from monetary policy has diminished and stock market leadership has at times turned away from those areas best positioned to benefit from the proposed fiscal policies. While the latest delays could push some key fiscal policy initiatives into 2018, the odds still favor corporate tax reform ultimately being achieved, along with progress on deregulation and potentially infrastructure at a later date. What are the implications of fiscal policy as a new market driver? Much like a portfolio can benefit from diversification, the economy and markets can benefit from different drivers working at different times. If we have shifted to new market dynamics, including a greater role for corporate profits, understanding the evolving opportunities will be important for diversified investors. As monetary policy powers down, business fundamentals power up, and fiscal policy helps get the U.S. economy off of standby mode, LPL Research’s Midyear Outlook: A Shift In Market Control can help you identify opportunities that may arise, navigate the challenges that will inevitably come, and help you stick to your long-term investing plan. For your complimentary copy of Midyear Outlook: A Shift In Market Control, please call our office at 615-826-5203.